Broadcast television is the point where the creative arts and technology meet. It’s different from any other discipline as to operate at an optimum level, and get the best possible quality, artisans, producers, and creatives have a deeper technical understanding of their craft than any other artistic discipline. And over the years, the demarcation between creativity and technology has become blurred as members of the creative teams have found themselves delving deep into engineering disciplines. Graphic artists are a good example of this. Drawing pictures on a computer screen is only part of the story, and just looking at the image and admiring its aesthetic beauty is not enough as awareness of parameters such as color gamut, luminance levels and aliasing is paramount. Not understanding these technical constraints could easily lead to an image that might look outstanding on a big screen, but could cause problems throughout the transmission chain, including codec distortion or co-channel interference caused by over-modulation in the transmitter. Broadcast IP is in its infancy and we have many challenges ahead of us, not just with integration and making it work reliably, but also with a plethora of operational questions. 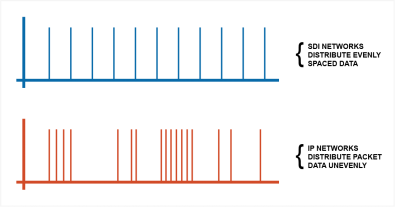 SDI, AES and MADI all share a common method of operation, the video and audio is transferred in the application layer and is linked directly to the underlying clock system - each data sample of an HD-SDI signal is directly integrated into the system clock resulting in a strong, perfectly aligned bond between clock and data to deliver stable and reliable connectivity. Unfortunately, this rigidity makes systems inflexible and difficult to change. Driven by viewer expectations, modern broadcasting is going through an unprecedented tectonic change, not just in engineering and technology, but in the production delivery domain too. Producers must have the resources to react quickly and experiment with new formats as they become relevant, such as VR, 360 and HDR, as well as OTT and internet deliveries. IP networks deliver this flexibility for us, and their popularity is not necessarily in the financial savings perceived with procurement of commercial-off-the-shelf (COTS) routers and switchers but is instead the massive gains achieved through flexibility. Dia 1 - IP Datagrams can travel on many different layer 2 protocols and networks. 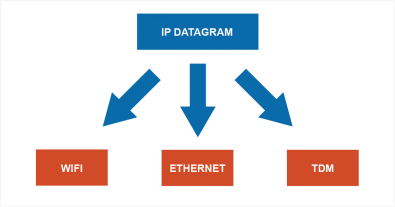 Distribution of IP datagrams is independent of the underlying hardware. The fact that IP datagrams can easily travel over ethernet, WiFi or TDM networks is its most powerful attribute for broadcasters since moving between different networks becomes completely transparent to us. As users, we do not know or care how an IP datagram traverses through a network to reach its destination. To fully utilize IP, production crews need awareness of the quality of IP networks and the reliability with which they deliver datagrams. For IP systems to be accepted, simplified methods of measuring and indicating their reliability are required. As we progress through our IP journey, production crews will learn a similar level of understanding of IP as they do with video and audio. Broadcast engineers are developing their skill sets to embrace IP integration, but their understanding is at a much deeper level than would be required for normal studio operation. A picture breakup could be due to a simple time drift, or equally it could be due to lost packets. Before reaching for the engineering-help-line, production crews will need to provide their own front-line diagnosis and remedy, otherwise the studios will soon grind to a halt. An analogy is reducing the video gain for a high luma signal – production crews know how to do this and would not usually call engineering to rectify it. IP operates as an asynchronous network and the strict timing relationship of SDI, AES and MADI clock and data has been stripped away – liberating broadcasters from the rigid SDI hardware-centric infrastructures of the past. But timing is incredibly important to guarantee smooth motion pictures and distortion free audio. Precision time protocol (PTP) is the system used to replace the data and clock relationships of SDI, AES and MADI. Using a master and slave topology, slave clocks are synchronized to a master through the PTP protocol ensuring cameras, microphones, or contributing feeds from outside broadcasts have their cameras and sound both phase and frequency locked to facilitate seamless transitions through the production chain. Dia 2 - SDI, AES and MADI data is evenly distributed, IP data is not. A drifting camera PTP slave clock would soon cause picture break up resulting in significant distress for the viewer. In the same way that a production crew uses a waveform monitor to diagnose over-exposure of a cameras’ video feed, or a phase meter to detect reversal in an audio stereo pair, the production crew must be able to quickly diagnose basic IP network related issues, such as too much PTP slave clock drift, or buffer under and over runs for IP datagrams, likely caused by jitter exceeding buffer recovery. 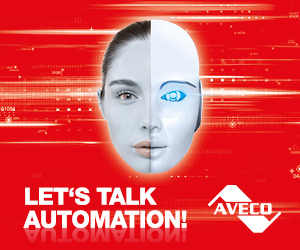 New challenges always inspire new and interesting innovation, and this is evident in solutions from companies such as Bridge Technologies who have provided their Instrument View tool. 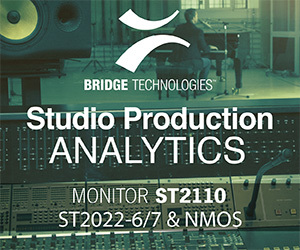 When used in a live environment, Instrument View, using distributed real-time probes, allows production teams to monitor live uncompressed video streams in real-time. IP opens the world to real-time implementations of HDR production. Not all feeds are HDR compatible, so production crews will mix and process video from HDR and non-HDR sources. This has the potential to become a logistical nightmare, but IP is abstracting away the underlying timing constraints of the hardware from the video and audio, so HDR metadata can be processed independently of the video images. For mixed HDR to work efficiently, frame accurate timing must be respected, but this is near impossible to achieve with the naked eye. Advanced tools such as Instrument View allow us to dig deep into the IP data streams to both determine the accuracy of frame accurate metadata and establish the validity of the colorimetry being described. Browser based monitoring tools are the way forward as they offer greater flexibility when diagnosing and monitoring systems. Combined with WiFi, any browser enabled device will have access to the underlying data. Production Crews will no longer be limited to working in the locality of the monitoring kit, but will, in effect, be able to work from anywhere with a network connection, even in a different country. Migrating to IP is liberating for broadcasters as it removes the timing constraints and lack of flexibility provided by traditional SDI, AES and MADI systems. However, in doing so, production crews must be aware of the technical challenges asynchronous IP networks offer and the new monitoring solutions needed to measure them.